We planted several sapling peach, plum and pear trees this year. All the pear trees are doing fine. 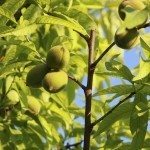 The peach and plum trees sprouted leaves and within a week the leaves fell off and the trunks started to turn yellow and an odd shade of brown. I still have a few that are not doing this, but I am clueless about what to do and if I can save any of the affected trees. We sprayed for insects. I did have aphids and my rose bush turned yellow but the new growth came in and it is fine. Please help. Proper watering is usually the cause of newly planted tree issues. Here is an article to help you with the care of new trees.